Regardless of exit strategy, every businesses and brands is seeking sustainability. In a quest to win market share, many businesses prematurely invest in SEO, social media, content marketing and advertising, when leveraging these investments for optimum results and ROI, requires they first become a publisher. 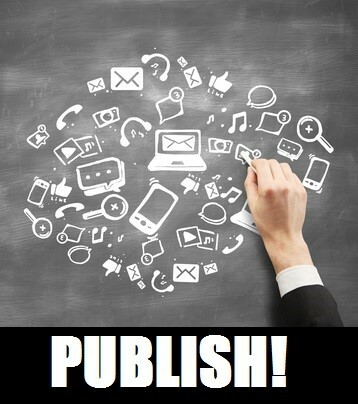 I have been emphasizing the “brand as publisher” model to clients for over a decade. The buzz term now is “content marketing”, which many distill down to blog posts. Still, many businesses resist the reality of the landscape in which they compete. Below is the essence of the case I make when convincing them the brand must publish. Brand Publisher vs Content Marketing? Beyond the mere concept of content marketing which often focuses on publishing blog posts, the mindset of the publishing brand leads the conversation around topics vital to the success of their core offering in text, video, audio, conversation and search. Publishing enables brands to gain a distinct competitive advantage. Here are five compelling reasons for every brand to embrace and run with the concept that they are a publisher. If a brand is not “the” authority on the topic related to its primary product or service, who should be? When strategically planned, created, optimized and distributed; conversations around the topics related to the problems a brand solves contribute to the creation of trust and authority in the topic – to humans (customers) as well as search engines. Publishing content for consumption as written word, audio and video feed social media updates, conversation and visibility in search directly impact clicks to conversion. Brands must first put their message in the path of target audiences (customers, media, investors, etc.). It is important to remember that search doesn’t just happen on Google, Bing and Yahoo. Search also occurs on YouTube, social platforms like LinkedIn, Twitter, Pinterest and Facebook. Planning, optimization and proper targeting makes all the difference for the brand publisher. Proper strategic optimization can make or break any brand’s investment in becoming a publisher, so be sure to invest in proper optimization to fully leverage the relationship between social media and search. When content is optimized to appeal to customers, based on a specific aspect of their purchase decision, it becomes extremely valuable. The greater the understanding of the customer journey, the more effective the brand publisher will be. A publishing brand will insert itself into each of the many considerations and discussions relevant to how their customers come to the final decision. The investment to demonstrate understand of the many aspects of the problems customers face, improves the brand publisher’s chances to solve that problem with their product or service. Today’s digital, social marketplace enables brands to connect with individual customers like never before. However, like any other aspect of human relations, a brand must make an investment in order to win the hearts and minds of customers. Brands who listen, publish, engage and invest in relationships with customers understand that each customer won, or lost, has influence over many others who will be influenced by them. A single review gone viral can make or break a brand. Acknowledging that every customer holds the future of the brand in their hands amplifies the value and impact of a strategic planned stream of conversations that continually reveal the value of the brand. Truth is, customers control the destiny of the brand. They really always have. However, social media has created a transparent competitive landscape that will amplify all that is good (and bad) about a brand. What many now call “content marketing”, many brands distill the concept of publishing down to blog posts. The publishing brand understands the value of taking a proactive role in creating informed customers, engaging in conversations, and promoting the value of the brand. The brand that adapts and responds to the demands of customers over time will always appear to be relevant and responsive. Question: If a brand doesn’t lead the conversation about the problems they solve, who will?